We had been primed to expect the worst of the winter weather in January, but, 4 days in and it just keeps getting better! – Yes, we carry fleeces when we go out – there does tend to be some wind around – but the sun does appear for many hours each day and it’s warm/hot if not sizzling…. Find a place where the wind doesn’t gain access and some folk think that it’s summer…………. Hey, it’s January 4th – where’s your fleece and grey-face look? Balcony at the villa, and, believe me, Amanda would not do this just to help me emphasise how warm this January is. I must say that at 54 years old (that will get edited out!) and 33 years together, you don’t need to ask why we watch little or no TV in the evenings – that’s right – we’ve got the internet!! For anyone that may not have experienced the wintering in southern Europe lifestyle before, I should quickly point out that once the sun goes down it can get chilly – nothing sub-zero-like – we enjoy temperatures of around 16°c to 18°c during the day (with peaks to maybe 21°c+ in sheltered locations) dipping down to around 10°c in the evening and then just 6°c overnight (or the part of overnight/early morning that we experience!). It’s definitely Twernt heater territory whenever the sun isn’t with us ….. The last couple of days have meant shorts and tee’s (swimsuits for some!) – so when is the nasty January weather that we were told to expect going to happen? As Amanda absorbed the solar rays that will no doubt be converted to energy before the day is out (probably vocal energy – ‘Where’s my Vino Tinto?”), I busied myself getting an up-to-date blog out, responding to comments and checking out our itinerary. On the Leisure batteries front there does appear to be a mix of opinion amongst ‘experts’ – I am left totally confused and without knowledge of why our Leisure Batteries failed. I will check out some suggestions and take matters from there, but, erring on the side of caution, I will not allow us to engage with reverse polarity again. With our packing done and all outstanding matters attended to, our aim to get back to Twernt by around noon was exceeded by only 4 hours! Martin will be returning to collect us at 6:00pm for dinner at the villa, so we had a 2-hour window to prep Twernt ready for the ‘off’ tomorrow morning. We needed to re-pack our gear and I needed to check Twernt’s fluids (Twernturology), plus the garage needed tidying, leaves needed extricating from the area below the windscreen, the tyres needed kicking, etc., etc. We arrived back at Twernt and I was very p”$$&£-off to see that a MoHo had arrived (since Friday) and taken the pitch directly behind Twernt. We have been watching this situation for over a month now and we have hoped, as each newcomer arrived, that they wouldn’t take that pitch – there are many pitches available – more MoHo’s are now arriving here (true to January form!) – but THAT pitch was my best chance of getting an exit from this camping without considerable faffing around and the risk of whacking into one of the many trees on this site. Bummer, bummer, bummer. Swedish MoHo – I wonder if Twernt could push it through that fence? AlanVW (famous forum member) – you were right – I am now a prisoner on this prison camp (Alan calls all campsites ‘prison camps’ and we’ve seen some that prove his case! – but not all!). 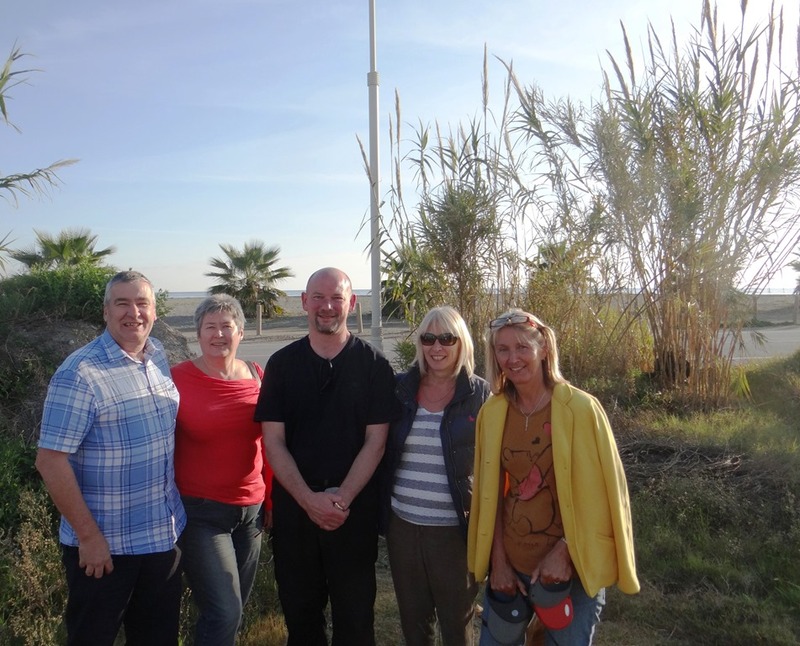 I started a casual conversation with our Swedish neighbour and his wife, discovering that they are en-route to Almunecar to meet up with relatives – they don’t know of any campsites in Almunecar (neither do we!) so I told them about the free wilding spot around the corner – the one we were supposed to be moving to on Monday morning. It’s free, it’s nearby and I need your pitch! Now we have a choice, we could hang around in the hope that they will scarper quite soon or I could attempt to get Twernt out of here and risk getting up close and personal with those trees. I have checked and re-checked and I may be able to reverse up to the back of their MoHo (which protrudes into the avenue by about 1 foot!) and then use the 3 to 4 feet of space that will be freed up to try and turn Twernt into the avenue – this would still mean reversing into the avenue where trees exist on both sides and Twernt will need to avoid a large branch that protrudes on the offside – and that branch is quite a bit lower then Twernts height. The avenue width, with that branch taken into account, may just be wide enough for Twernt to squeeze through, but attempting this will involve removing the cycles and the cycle tow bar mounted rack, stow them on a vacant pitch and then re-mount everything once we’re facing the right way to make an exit from the camping. Had Mr. & Mrs. Sweden not been on that pitch I could have reversed straight back into the pitch and swung around back into the avenue without needing to negotiate my way past those trees. Still tight but do-able. I may try to get out but it would be prudent to wait until 11:30am – in the hope that Mr. & Mrs. Sweden scarper early on – or should I wait another day or three? We returned to the villa and enjoyed another of Jill’s meals – salmon de dubris whatsit – very nice! Then it was back to Twernt and a beach walk in the dark for the dogs before we settled down for the night – no internet now as our 30-day deal has expired. Life without the internet is BORING, maybe I should take up cooking? My first ever menu will definitely include Swede, that’s for sure. Maybe Haggis, Tatties and Neeps? Hmmmm ……. Burns Night Supper menu…..hmmm …. burns ….. hmmm ….. trees ….. I could help a lot of people out here, including myself ………… now I’m cooking! I did note when performing my usual pre-leaving checks that the new Leisure-Battery-That-Is-Really-A-Car-Battery has held charge since Friday and is now at 13.3v in solo mode even after being put under load from lights and the water pump for quite some time. Das is gut, mein Herr. The Scottish menu ingredients from Sweden lovely couple from Sweden showed no signs of moving on this morning, we therefore resigned ourselves to staying at Camping Playa Granada for at least one more day. I unloaded everything needed for a busy day of outdoor activities onto Twernt’s pitch – chairs, table, stools, etc. and then decided to check out the Oxford Maximiser Battery Tender/Charger – we used to be dealers for Oxford Products and this Charger was a left-over from those days, I personally used Optimate chargers on my own bikes. I had kept this Maximiser because it will take both lead-acid and gell batteries from a poor condition and attempt to ‘rescue’ them according to a built-in program. After checking electrolyte levels, I set-up one of the Varta Leisure Batteries and the Maximiser started the process of recovery. All was good – the Maximiser quickly passed through the ‘recover’ stage and then, equally as quickly, passed through the ‘charge’ stage before settling at the ‘maintain’ stage – this stage includes executing a battery drain to test if the charge has been held by the battery. Finally the Maximiser will declare that the battery is either ‘good’ or ‘naff’. Nothing to do but wait, the manual does state that the process can take up to 22 hours but I guessed that this time included the 2 stages that were passed through in less than a minute. The ‘maintain’ stage started with the battery at 11.7v and this went to 11.8v some minutes later – time for coffee and I will check back later. Responses to my blog on ‘reverse polarity’ (RP) were confusing and mixed – experts stated that it wasn’t possible for the Sargent charger to screw up the batteries as a result of RP input to them. Others, from an engineering forum, stating that it was possible. Add to that some responses from other MoHo owners who still run on RP without problems and I AM CONFUSED!!! Our L/Batteries were fine before Ria Formosa – they ran for 6 days or whatever at Portimao (from solar) without a hiccup and they were goosed when we left Ria Formosa – they had depleted and re-charged on numerous occasions previously – no problems. Could those shaky, dreadful, Portugeuse roads have caused some damage to the batteries as well as everything else that they did? I cannot think of any other ‘incident’ that it could be – the new Leisure Battery (that’s actually a car battery) is installed and it’s working and charging fine from both the solar input and the Sargent PSU. At 12:15 I went back to check on the Varta battery being recovered (hopefully) and saw that it was now at 11.4V – maybe it was in the ‘load’ part of the program. We shall see. Then I looked over and saw that Mr. & Mrs. Sweden appeared to be packing their bikes and chairs – Amanda was away on a shopping trip so I didn’t have my ‘Mildred’ to confirm this observation – – so….. a double take, and, yep, sure enough, they were leaving – my inquisitive look received a ‘Yes, we go now to Almunecar’ audible response (Almunecar is pronounced Ow-my-nacker). My next words included ‘Ragman’s’ and ‘Trumpet’. You’re supposed to leave the camping by noon! And, if you’re Swedish and if you’re in my way, you’re supposed to show signs of leaving before 12:15 – or at least mention it to the ONLY person on camping that had spent time chatting with you (for over half an hour) the previous evening! Internally seething at this boorish behaviour – this was probably going to cost us another day’s camping fee – I took the only reply route open to me as I bade them farewell “Nice to meet you, hope you have a nice time in Ow-my-nacker” – I thought “That’ll teach them – I used the word ‘nice’ to them!”. They must have driven off with Mr. Sweden saying to Mrs. Sweden “Did you hear what da Englishman said to me – he used da word ‘nice’ – he must have been very angry about something”. Amanda arrived back from her shopping trip 5 minutes later and walked into a scene akin to a Californian home owner who is hastily packing his worldly goods as a forest fire rages 10 metres away from his property (Bloggers Tip: go for the back-up drives and then any humans and animals) – I was furiously packing everything away that I had unpacked less than one hour before. The battery saga will have to wait until another day. By 12:45pm we were ready to leave. I manoeuvred Twernt around the many trees that are designed to make you extend your stay once you’re here (and having seen the scrapes and many near misses that take place with just about every MoHo arriving or leaving – the feeling, once pitched, is ‘No, I’ll stay here a while longer – at least until they cut the trees down or go out of business and I’ll cut them down myself’). Amanda went to settle money-matters at the office. Having literally had to put Twernt within an inch of a tree more than once, I eventually straightened it/her/him up and drove down the avenue and waited for Amanda to finish making the payment for our 34 night stay here. I was then informed that there was a delay due to the owner not knowing how to use the debit card machine and his wife (who did know) was out. So I turned the engine off and sat in Twernt – now blocking all arrivals/departures from the camping. ‘Gonzalo’ eventually managed to process our payment (after a lengthy cell phone call to his wife, ‘Carlota’) and Amanda returned to Twernt. Ignition on, key turned and ………… ‘click’! A few more tries, a few more fails. Ah! – this time I do have a ‘spare’ CAR battery from which I can jump-start the vehicle battery – the new vehicle battery that we bought in Dieppe! Garage opened – search for jump leads – fix to CAR leisure Battery and then, Oh, bugger – I have to faff around to get at the vehicle battery compartment in the passenger-side footwell. OK, ‘Let’s turn the key one more time’. I did, and Twernt roared into life. Unfix the jump leads, close the battery hatch, return to the garage and stow the jump leads. A 16K-miles Ducato, that’s what! Ducato – Ducati (motorcycles known for their electrical weaknesses) – I want a Honda MoHo! or a John Bloor one! Ne’er mind, most vehicles that I’ve had require a learning curve to be able to live with their foibles and weaknesses and I’m still learning Ducato – note to self: stow some of my blood pressure pills in the little cubby-hole on the dash. 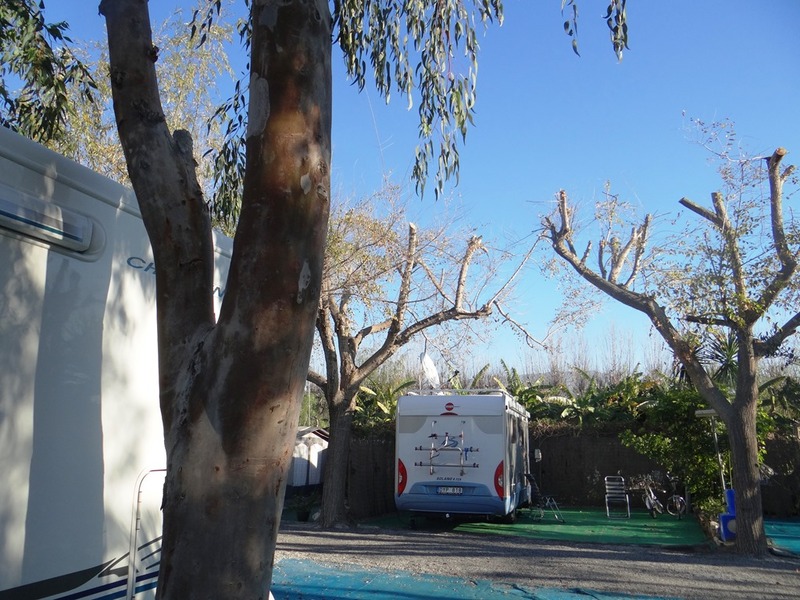 We left camping Playa Granada for our new location – Play Granada Gratuito Parking – 300 metres or so down the road. We arrived after a testing journey – we reflected on our speedy Twernt packing procedure, on negotiating trees, on making a 2 minute camping-charges payment in only 20 minutes, on the Twernt ‘won’t start’ episode and we summed it all up with a ‘Thank Venus we’re out of there’. Twernt at Playa Granada Gratuito Parking – the ‘B’ road is in the background and then it’s beach. The promenade ended a few metres to the left of this picture. We arrived at our new camping stop-over some minutes later – it could have been two minutes but was more probably closer to three minutes. We parked up, opened the lounge window, and, ‘Whoa’, “What’s that smell?”. And not just a smell – there was also a pool of diesel underneath the engine bay and a diesel-trail leading back to the road. Did you know that diesel burns slower than petrol? Our diesel filter problem had returned and this time we have to get it fixed pronto. Apparently Fiat have upgraded the plastic threaded diesel filter housing with a metal one as the plastic one has proved problematic – resulting in new diesel filter housings being required on a lot of Ducato’s. A known weakness – probably helped along in my case by the shaking delivered by those Portuguese roads. Not a great day but the sun was shining – so I buggered off across to the beach with Tilly. Perspective over all things begins here….“And those who were seen dancing, were thought to be crazy, by those who could not hear the music.” ― Friedrich Nietzsche – these parasols are dancing to a tune that I like. When I returned Martin & Jill had arrived at Twernt. Hands up anyone with ambitions to become a vicar…………. Jill & Martin will be leaving tomorrow and they will be driving up to San Sebastian for a few nights of partying with friends before they return next Monday to Malaga for their flight back to the UK. I decided to cycle into Motril the next day, Tuesday, to search out a Fiat dealership. As we stood chatting, Pauline & Phil Lloyd, originally from Stockport and now Spanish residents for over 9 years, arrived. 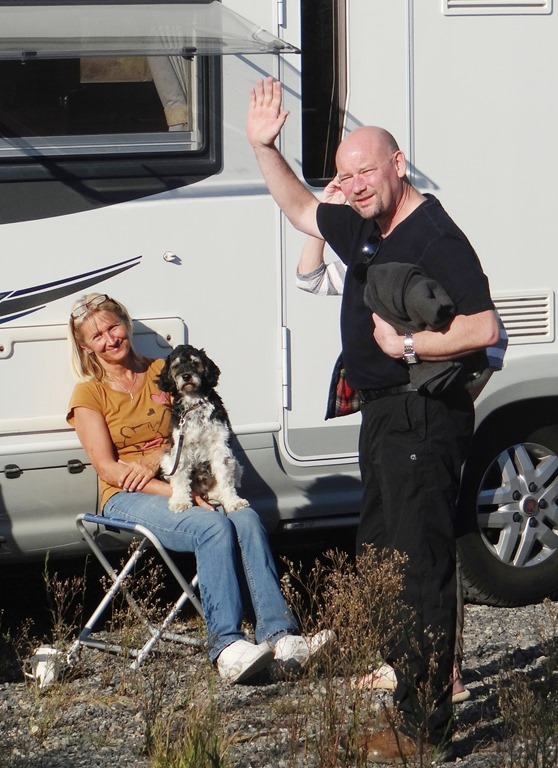 Pauline & Phil live in a village near Orgiva – just north of Motril and we had made contact via an on-line MoHo group that we both frequent – The Motorcaravanners Club. The problem now was that we are on a ‘tolerated parking’ lot and couldn’t really put out any chairs, etc., therefore, the six of us stood around nattering and Pauline, a former university administrator and Phil, a plumber, were an absolute mine of information for us!! Sybil fixed some tea and coffee and Phil & Pauline checked out Twernt’s interior – Sybil forgot to hand out the cake that she’d bought especially for their visit – I’d just like to apologise to them both and assure them that it was the best cake that we’ve bought so far in Spain, I enjoyed it on your behalf Phil! First up in the information gleaned stakes was that tomorrow was Three Kings Day – a national holiday in Spain! Then we learnt that Phil has been appointed ‘King’ in their village. We have a King visiting us on the eve of Three Kings Day!! – and, fittingly for the information age in which we all now live, King Phil and his Queen, Pauline, brought us many gifts of very, very useful information. Any thoughts of cycling over to Motril quickly disappeared as all businesses will be closed tomorrow! I was also given road directions to the Fiat dealership in Motril but that trip would now have to wait an extra day. When our visitors had left we settled in for a night of wild camping – no EHU, no Internet – just dinner – dogs on the beach and solitaire until the tablets ran out of battery juice. Boring. The co-ords for this wilding spot, should anyone be interested, are W 3° 33’ 1.2” and N 36° 42’ 57.1”. 3 other MoHo’s were also ’wilding’ here. A quiet day today, watching the masses of folk walking, running, roller-blading, skate-boarding and cycling along the promenade and the link path to the Playa Granada resort. Spanish folk, young, old and very much older all seem to take part in these activities. Throughout the day, from before first light until well after dusk, hardly 30 seconds or so would pass before another activity freak, or group of activity freaks, appeared on the promenade. Busy, busy, busy. Martin & Jill arrived around lunchtime and Jill had prepared lunch and transited it over to us – Jill, my sister, is very much like our Mum – everyone has to be fed and then fed some more. Martin’s success in losing a few stones in the last 18 months is very much at risk now that Jill has retired – hmmmm …. that gives me an idea! …… maybe we won’t need another bricks and mortar property – I’ll be able to erect a small bungalow just beneath Martin’s chest in a couple of years from now! Seriously, Martin and I are now at the exact same weight and, whilst Martin has maintained his weight position, I have put some weight on over the last month or three. We spent the day on the beach and hanging out at Twernt – Jill also gave us a mass of food products, all left-over from their stay at the villa. Help! – my next pizza is in component form and without assembly instructions!. Thanks Jill & Martin, for our villa time and for all of those meals – but mostly for the time that we were able to spend together. Just a stones throw away from Twernt ……Oi!! Jill “Did I do that?” – Yep, you’re now a retired and incontinent teacher – TA’s, mop that lot up! 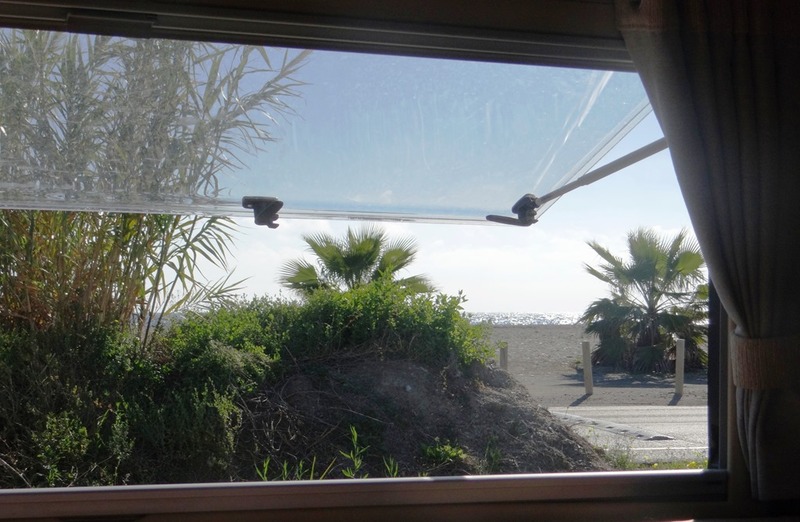 Tonight there are now 7 MoHo’s ‘wilding’ in the parking lot, we plan to get to the Fiat dealership by 8:30am tomorrow, get a quick fix and make it over to an aire in Almeria by mid to late afternoon…………. It’s all good now Maggs, Eric (BigMomma) has reported the same ‘click’ starting that we get. Leaving it a few minutes seems to do the trick. It may be immobiliser related, must ask Eric if he has an after-market alarm/immobiliser (we do). It’s all a part of getting to know the vehicle! 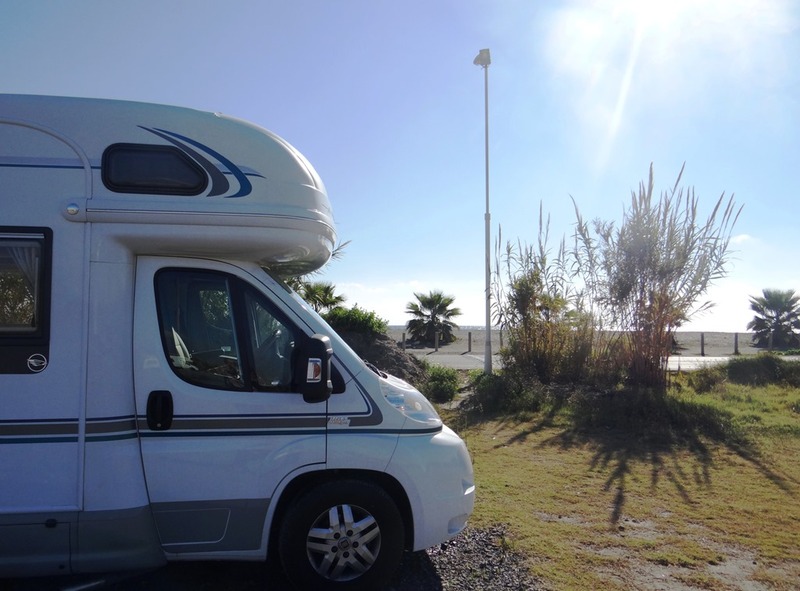 In general the Ducato’s are well proven and ROX1 is new so you shouldn’t get problems – providing you don’t fit vibrators under your wheels (or run on Portuguese roads – which amounts to the same thing!). Hi Roy & Amanda – glad to see you got off the pitch minus trees, great blog entry. On the subject of the engine battery, did you know you can jump start the MH without having to go into the battery compartment under the passenger seat? Lift the bonnet and to the left of the air filter is a small black box affair with a flip top. Lift the flap and it gives you access to two +ve terminals. If in doubt, trace some of the big/thick 12v cables back to this box. Then hook your red jump lead to these terminals and the black jump lead to a point on the engine such as an engine mount. Job done. We use these connections when using a transfer pump to get water from the Aquaroll into the tank – only because the pump came with crocodile clips and I haven’t got round to either extending the cable on the pump and/or fitting a ciggy type connector. HTH and enjoy the good weather – our gales are their way to you lol. Any problems or questions, give me a quick (very quick) call on my mobile. How do I get my no, to you without the whole blooging world seeing it though? Brilliant! Thank you, I didn’t know that and it’s good info – I will test my jump leads for reach, they are extra-long copper ‘jobbies’ so should just about do it. There are some big MoHo’s here on site (including one of those Morelo’s! – yearn!) so I may stay here tucked away between the tall guys if a storm heads in here – 10 day forecast is all sunny between 16°c and 18°c, winters can be so harsh here (!). Fab pic of Jill!! Really v.much enjoyed this and Mom looks way better in a bikini than I would!! Jill was determined to get her toes in the Med! I’m a man and I know what a bikini looks like – your Ma was wearing a swimsuit!! 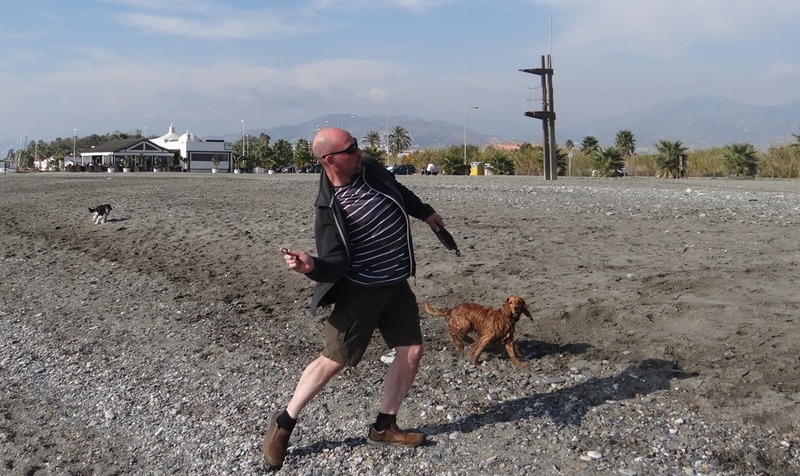 Down to the Vera Playa for us today, no idea what it’s like but we’ll find out soon enough, hopefully there will be a dog-friendly restaurant there! Mel called to say how warm it is in your area right now, here’s hoping it’s good in March/April when we get back! What holly said – looking super hot in the swimwear!